One of the project management tools in the second phase of the West Metro is a war room which continuously generates real-time information on the project schedule and costs. Another aim is to streamline communications between all parties to the project. In the West Metro’s big room, a situational picture of the overall project is continuously monitored from real-time digital displays. This involves a war room which has been in use for the project since the spring of 2018. “Our goal is to obtain accurate, real-time and sufficiently clear information to enable problems to be tackled right away. 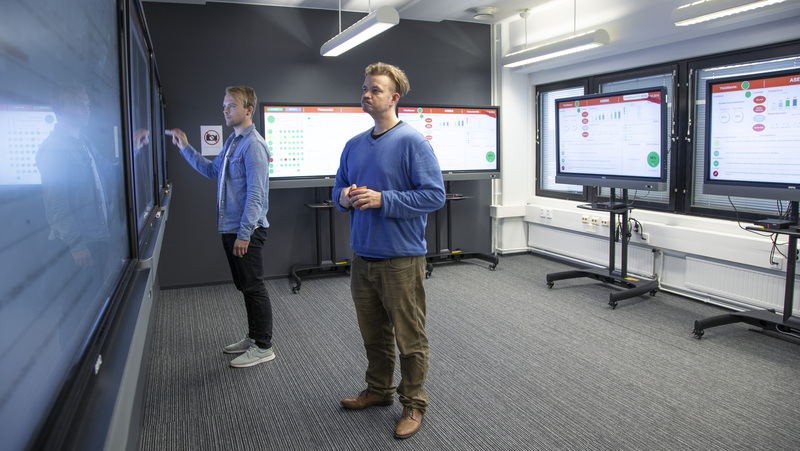 To achieve the budget and schedule-related goals of the second phase of the West Metro, we had to create a new way of managing the project and thinking about project management,” says Timo Heiskanen, War Room Manager at Länsimetro. The progress of the seven sub-projects – the five metro stations, the depot and the line – is tracked throughout the construction cycle, from the planning, acquisition, permit application and execution phases onwards. As well as the project schedule, the costs, risks, quality, smoothness of cooperation and occupational safety are monitored, using a ‘traffic light’ system, from the war room. “These are the elements that create a successful project,” says Heiskanen. War room data enables real-time management and troubleshooting by the project management. “The project management meets regularly in the war room to discuss each sub-area in face-to-face meetings. This ensures that everyone is on the same page and can decide on corrective measures, if necessary,” says Jaakko Naamanka, Project Manager of the Matinkylä-Kivenlahti project. The construction of just one West Metro station is the equivalent of building a large shopping centre underground. A project of this size involves a range of actors – real estate developers, designers, equipment suppliers, contractors and the public authorities – all of which must keep to the same schedule and pull together. “Each operator is responsible for its own area: the basic principle is that the schedule is non-negotiable. It is my job to make the schedule as clear as possible to everyone,” says Heiskanen. A war room or situational snapshot means more than just monitors on a wall – they are part of an overall set of practices, holistic processes and a management culture. “The primary purpose of the war room is to communicate the situation to the different parties. Communication is a priority in large projects. When working towards a common goal, each actor must understand the impact of its work on the overall project. When developing the current model, we aimed at achieving the clearest possible communication on matters involving complex technical data,” says Heiskanen.